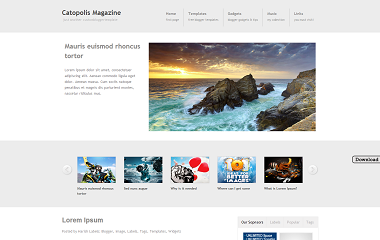 Catopolis Magazine Blogger Template is a free blogger template adopted from WordPress. It has a beautiful Slider and Menu Bar. It also has great colors like Gray and White. It has many features like 2 Column, Gray, White, Slideshow, Auto Readmore, 1 Right Sidebar, Right Sidebar, Top Navigation Bar, Custom Menu, Fixed Width, Magazine, WordPress Look etc. This Template is suitable for all types of blog. b. Click on Expand Widgets Templates check box. c. Search for Below line. d. After you see an Unordered Link list, Customize it with your Own. d. After you see an Unordered Link list with Images and Content, Customize it with your Own. d. After you see an Unordered Link list with Images and Heading, Customize it with your Own. 5 Person has expressed his thoughts, Now you turn guys!